In your student groups, you can view the page history and see the date, time, and author of any changes made to the page. Page editors can also restore the page content to a previous version of the page. Note: If your instructor allows students to edit course pages, students will be able to view the page history but will not be able to restore a prior version of the page. Click the Options icon  and select the View Page History link . View the revision history . 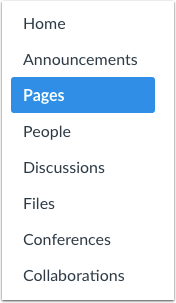 To return to the current page revision, click the Close icon . To open a prior version of your page, click the date  you want to access and then click the Restore this revision link . View the content from the latest revision. Canvas will remind you that this version of your page is the most recent revision . If you want to replace your current page with different content, click a different date and page revision. Click the Close icon  to return to the current page. Previous Topic:How do I create a file link in a page in a group? Next Topic:How do I use the People page in a course as a student? Table of Contents > Pages > How do I view the history of a page in a group?